I had my “Oh no, this is getting serious!” moment about Emerald Ash Borer last weekend. I went to give a homeowner an estimate for preventive control and discovered the tree was already beyond saving. The tree was in Table Mesa area of southwest Boulder. There were adult beetles on the tree which led me to find multiple exit holes on the trunk, but I knew as soon as I walked into the yard that there was a problem. There were still had leaves over the entire tree but the leaves were about a quarter of the size they should be. The leaflets were no more than an inch long. Clearly the tree was dying. So, one possible symptom to detect an infestation of the Emerald Ash Borer on a particular limb or on the whole tree is dramatically smaller leaves. I’ve seen trees where only one small limb has that symptom – an early indicator. The ash population in Boulder is in trouble this year even without the Emerald Ash Borer. Many trees are half dead with some leads completely dead and others still kicking. I’ve stripped bark and there are no borers involved. Three years of early season freeze injury and the November freeze drying have taken their toll. When I stripped bark, however, I did find canker fungi which I have not identified, but there were definite fruiting bodies. I don’t know if the fungi are secondary to the weather of if the fungi are the primary killers. It’s interesting that some trees are half dead and other ashes, with all the rain, are just robustly healthy. 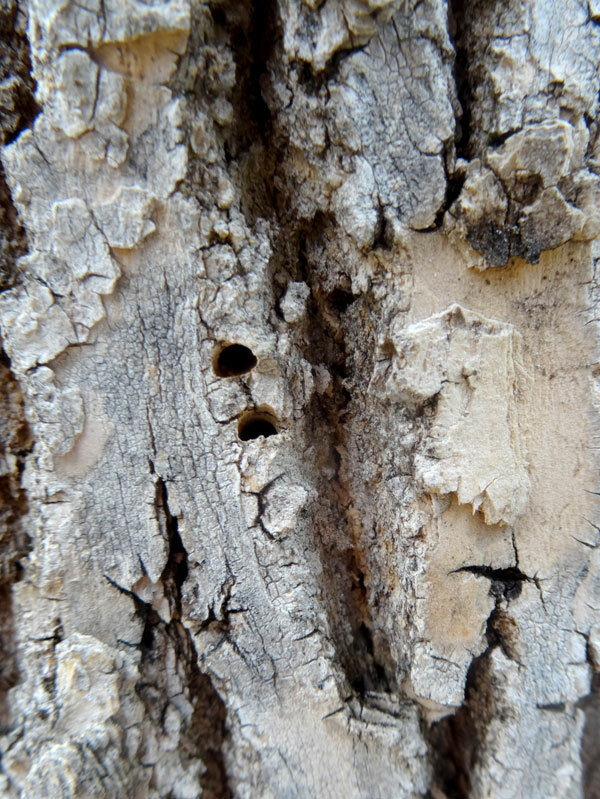 Anyway, the EAB problem in Boulder is at the critical stage. There’s no more waiting. It’s time to either treat the trees or lose them. I think an important role for the arborist community at this stage is to help owners decide whether the trees should be saved. Clearly only healthy specimen trees with good structure are worth the expense of the costly treatments and the tradeoff of possible environmental side effects. This entry was posted in Uncategorized on June 29, 2015 by Stef.